Chinese Scholar’s Garden, August 17th! American Museum of Natural History, August 10! This Friday August 10, we will be traveling to the Natural History Museum! Please meet us at 9:45AM at The American Museum of Natural History at the W81st street entrance between Columbus Avenue and Central Park West. Pick-up will be at the W77th street entrance between Columbus Avenue and Central Park West, at 12:00PM. Please have your child wear his/her China Institute t-shirt. Pack a light snack and water. Welcome to the beginning of Session 3, Walk Along The Silk Road. Today, in the toddler class, we learned about the life cycle of a silkworm. We started by introducing ourselves to each other and went over the classroom rules. Then, we read a book showing and explaining the life cycle of a silkworm. Some of the terms we learned to day in class is 蚕、蛹、叶子. Then, we made leaves (out of cardboard), eggs and silkworms (out of air dry clay), and silkworm moths (out of coffee filter and string). In the beginner (4-7) class, we went through morning station time and got a chance to meet the new friends! Our morning meeting focused on checking and predicting the weather, as well as to share a fun Chinese fact – why did the clothing in Ancient Chinese come with very long sleeves. Afterwards we introduced a new friend named Zhang Qian to the students. Zhang Qian was a Chinese official and diplomat who served as an imperial envoy to the world outside of China in the 2nd century BC, during the time of the Han dynasty. Today, Zhang Qian’s travels are associated with the major route of transcontinental trade, the Silk Road. The Silk Road is called “silk” because of the major products traded was silk cloth from China. The students watched a video about how silkworms make cocoon silk blankets. Then the students started to explore the first part the story of Zhang Qian pioneered the Silk Road. In the advance (4-7) class, we went over the class rules and morning routine in Chinese. Then, we read the picture book “医生你好“. Afterwards, we reviewed the terms and sentences “someone 喜欢、不喜欢， 因为…” and learn to introduce personal favorites. Towards the end of class, we decorated all the classwork they did today. In the beginner (8-14) class, we listened to music on the Silk Road and had our students give us their thoughts on the Silk Road. Then, we practice having conversations in Chinese by taking turns being a customs officer as we learned name(s) of countries and made a passport. In the afternoon, we all enjoyed an amazing music performance by Ms. Jiaju and Ms. Weiwei, who played pipa(琵琶) and guzheng(古筝)! And through the We All Live in the Forbidden City workshop, we were taken back to China’s ancient palace. Check back in for more updates about our program! Time flies! We can’t believe it’s already August! Welcome to our summer program session III! For this session, let’s get on the cross-cultural journey of “the Silk Road”, a great way to explore Chinese language and cultural elements as the Silk Road famously connects different cultures between China and Eurasia since as early as 1 A.D.! Language classes in the morning and our afternoon music, cooking, STEAM* activities will be centered around this fascinating theme. On Fridays in this session, our field trip adventures will include the American Museum of Natural History and the one and only Chinese Scholar Garden in New York City! In addition, we are excited to have 16 Chinese students visiting from Chongqing, China. They will spend 2 days with our camp on August 8 and 9. The bilingual cultural immersion will be concluded with a performance on the afternoon of August 9. EVERYONE is invited! Stay updated through our Children’s Program Blog! We will be going outside on Tuesday morning and on Thursday afternoon, weather permitting. Please make sure they wear appropriate clothes and shoes to run and play outdoors. The summer program starts at 9am from Monday to Friday (there may be slight time changes for Friday field trips). Please arrive 5-10 minutes prior to 9am to drop-off your child, and pick your child up at 12pm or 3pm sharp (depending on whether your child is participating in the half or full-day program). Consistently picking up your child late (30 mins) or dropping off your child early (30 mins) will incur additional fees, please note the terms of enrollment. Throughout the day, we will provide snacks and water. However, we won’t be providing meals. If your child is attending the full day program (9am-3pm), please pack a lunch for your child. Please also bring a pillow and a small blanket for your child’s nap time after lunch on the first day of the program. Caregivers are only allowed to observe the first day of camp unless a special arrangement is made with the program. Field Trip Fridays (9AM-12PM): The starting time and location for field trips will vary depending on the opening hour of the field trip destination. We will advise you in advance of the meeting time and place for the Friday field trips. On field trip days, we will meet at the field trip locations, and the parents must pick up the students from the field trip locations. NOTE: Students must wear their China Institute summer program t-shirts on field trip days. 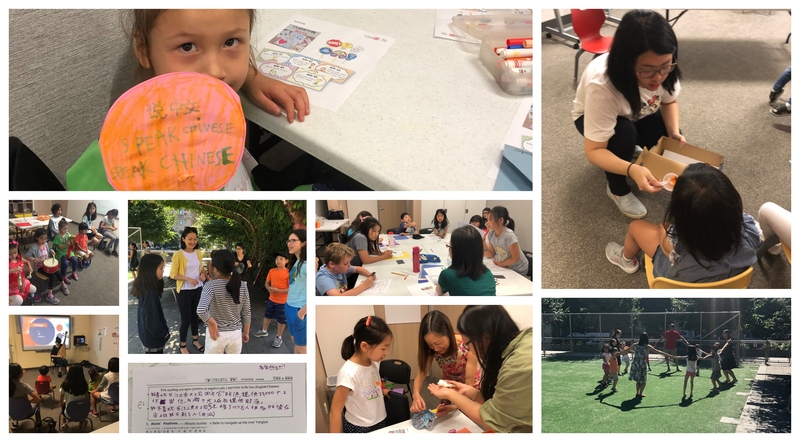 If you have any questions about the 2018 Children’s Summer Program, please feel free to contact Program Coordinator, Emily Marks at 212-744-8181, ext. 110. We are excited to have you in our program. Looking forward to welcoming everyone! Please see below some great memories of our field trip to MOCA last Friday! A Glance into our STEAM Class with Kay Laoshi! Last week, we had our STEAM class on Tuesday afternoon focusing on math and science. We did an interesting experiment with Ms. Kay called “Which 3D paper column can hold the most books?”. We went through the process of science: prediction, experiment, and recording. We also practiced Chinese through the process as much as we could! We first practiced some of the shapes that we can find in the classroom. Check it out! – The star shape (星形xīng xíng) and heart shape (心形xīn xíng) are very tricky to pronounce. We then chose the three most common shapes that we would like to further investigate. The triangle, the square, and the circle were made into 3D-shapes for the experiment. After we set up the materials for the experience, we started predicting what would happen. Can you guess which shape can hold the most books? We were so excited to discuss and shared our thoughts. While we were sharing, we practiced Chinese by saying “我觉得wǒ jué dé”, which means “I feel…” or “I think…”. One of us predicted that the triangle will be the winner and it could hold ten books! Good guess! Moving on to the most exciting part, we were so focused counting the books that Ms. Kay put on top of each 3D shape. The experiment got extremely intense when Ms. Kay was trying to put the 39th book on top of the cylinder. Everyone was holding their breath and hoped we could reach 40 books. All in all, we enjoyed the science class a lot and would like participate more in the future! For all of our new students, welcome! For all our old students, welcome back! Can you believe how quickly the session goes by? Last Friday for our field trip we traveled to MoMath! We had so much fun learning about math! We rode a bicycle with square wheels. We learned about angles and the way things fit together on a wall full of magnets, and we built towers with these amazing connector blocks! We had so much fun! We can’t wait to go on our next adventure! We will be going to the Museum of Chinese in America (MOCA) this Friday. -Please dress your child comfortably before coming to the program– we want them to feel at home. -We will be going outside on Tuesday morning and on Wednesday afternoon, weather permitting. Please make sure they wear appropriate clothes and shoes to run and play outdoors. -The summer program starts at 9am from Monday to Friday (there may be slight time changes for Friday field trips). Please arrive 5-10 minutes prior to 9am to drop-off your child, and pick your child up at 12pm or 3pm sharp (depending on whether your child is participating in the half or full-day program). -Consistently picking up your child late (30 mins) or dropping off your child early (30 mins) will incur additional fees, please note the terms of enrollment. -Throughout the day, we will provide snacks and water. However, we won’t be providing meals. -If your child is attending the full day program (9am-3pm), please pack a lunch for your child. Please also bring a pillow and a small blanket for your child’s nap time after lunch on the first day of the program. -Caregivers are only allowed to observe the first day of camp unless a special arrangement is made with the program. -Field Trip Fridays (9AM-12PM): The starting time and location for field trips will vary depending on the opening hour of the field trip destination. We will advise you in advance of the meeting time and place for the Friday field trips. —On field trip days, we will meet at the field trip locations, and the parents must pick up the students from the field trip locations. We look forward to seeing you and your child on the first day of class! Stay informed with our camp activities through this blog.